A collection o photographs frae the campaign. Frae tap an left tae richt: Ottoman commanders includin Mustafa Kemal (fowert frae left); Allied warships; the view doun tae Anzac Cove; Ottoman soldiers in a trench; an Allied poseetions. 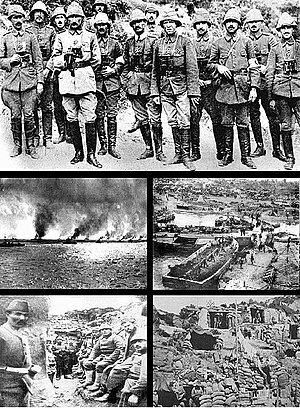 The Gallipoli Campaign, an aa kent as the Dardanelles Campaign, the Battle o Gallipoli or the Battle o Çanakkale (Turkis: Çanakkale Savaşı), wis a campaign o Warld War I that teuk place on the Gallipoli peninsula (Gelibolu in modren Turkey) in the Ottoman Empire atween 25 Aprile 1915 an 9 Januar 1916. ↑ 6.0 6.1 Erickson 2001a, p. 94. This page wis last eeditit on 11 Dizember 2015, at 04:16.